The Reserve Bank of India will be issuing final guidelines for foreign banks operating in India in the next few months, its governor D. Subbarao said Wednesday. Addressing a conference on the banking industry here, he said the central bank wanted foreign banks operating in India to set up subsidiaries so that their operations are easier to regulate. Mahindra & Mahindra, India's largest sports utility vehicle maker, has made its first push into the country's small car market a week after warning that fierce competition could erode its dominant SUV position. Amazon Seller Services Pvt Ltd, a unit of US-based multinational electronic commerce giant Amazon.com, Inc, on Wednesday announced the launch of an online marketplace in India — www.amazon.in. 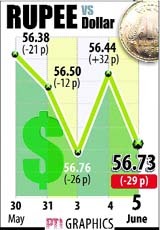 The rupee posted its biggest single-day fall in a week on Wednesday, hurt by heavy dollar buying by importers, particularly in the oil sector, and weakness in the euro. The rupee fell for the 12th session in 14, taking its losses to 5.2% since the start of May and becoming the worst performer in Asia over this period. 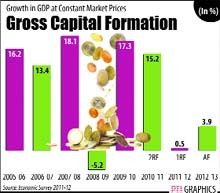 Gross fixed capital formation, a proxy for investment activity, has slowed down to 29.6 per cent of India’s GDP (at current prices) against 30.6 per cent last year. Larsen & Toubro (L&T) won an infrastructure contract worth nearly US $300 million from Saudi Aramco as India's biggest construction and engineering firm chases overseas projects to offset a slowdown at home. Search service provider Justdial rose as much as 19.2 percent in its stock market debut on Wednesday after the company raised about $165 million last month in the country's biggest listing so far this year. The contentious issue of coal price pooling is likely to be taken up again by the Cabinet Committee on Economic Affairs when it meets here on Friday to a take a final call on the issue after having rejected it earlier in April. 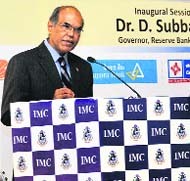 The Reserve Bank of India will be issuing final guidelines for foreign banks operating in India in the next few months, its governor D. Subbarao said Wednesday. Addressing a conference on the banking industry here, he said the central bank wanted foreign banks operating in India to set up subsidiaries so that their operations are easier to regulate. The RBI had first proposed such a model two years ago, but no guidelines were issued then. Subbarao said the central bank was working on guidelines so that various legal issues can be sorted out. At present 43 foreign banks operating in India have branches functioning in different parts of the country. However these are not subsidiaries, RBI officials say. “.... This will level the playing field for foreign banks and make the overall Indian banking system more competitive and inclusive,” Subbarao said. According to him, the legal issues would be resolved in the next few months. "Thereafter we expect to issue final guidelines," he said. Subbarao went on to say that the central bank was looking to regulate deposit-taking by different entities following the collapse of the Saradha group. "In the RBI's view, accepting deposits should eventually be restricted only to banks which are tightly regulated," he said. He also pointed out the need for regulatory oversight on nonbanking finance companies, and said eventually only regulated banks should be allowed to take deposits. PTI adds: Subbarao said the Financial Stability & Development Council (FSDC) should act only as a coordinator between financial regulators for ensuring financial sector stability. “There should be a coordination body such as the FSDC, but the coordination body should be just that — a coordination body which will have more importance during a crisis time — but in normal times, will be at a low level equilibrium,” the RBI governor said. SUV sales have been a strong point for some manufacturers in India over the past year, even as sales of the smaller cars that account for most of the passenger vehicle market slumped. Having a presence in the small car market will be a positive if demand returns in the next fiscal year, but Mahindra will have to compete with established brands such as Maruti Suzuki India and South Korea's Hyundai Motor. 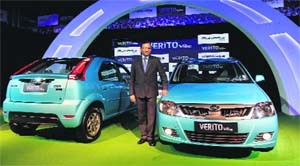 On Wednesday, Mahindra launched the Verito Vibe, a compact version of its sedan, at a starting price of Rs 5.63 lakh — among the cheapest of its passenger vehicles. "The Verito Vibe gives us the opportunity to play in the large and highly competitive compact car segment," Pravin Shah, head of Mahindra's automotive division, told reporters. The flagship company of the US $16 billion Mahindra Group builds every other SUV sold in India, but its share in the segment fell to 48 percent in the fiscal year that ended in March from 56 percent a year earlier, according to data from the Society of Indian Automobile Manufacturers (SIAM). In the passenger car segment, which excludes utility vehicles and vans, the company last year held less than 1 percent of the market that is dominated by Maruti Suzuki. Key to Mahindra holding its market share is not a small car but more SUV launches, some analysts say. "Mahindra will continue to lose market share in the overall passenger vehicle industry, because of lack of new launches (by Mahindra) in the SUV segment and an extremely competitive environment thanks to launches by their competitors," said Yaresh Kothari, an auto analyst with Mumbai-based Angel Broking. Starting with books, movies & TV shows video products, Amazon.In will introduce additional categories including mobile phones and cameras in coming weeks, the company said. "We're excited to get started in India and we will relentlessly focus on raising the bar for customer experience in India," said Greg Greeley, VP of international expansion at Amazon.com, Inc. "Our vision, at Amazon, is to be the Earth's most customer centric company; to build a place where people can come to find and discover virtually anything they want to buy online, he added. "With Amazon.in, we endeavour to build that same destination in India by giving customers more of what they want – vast selection, low prices, fast and reliable delivery, and a trusted and convenient experience," he said. The company has also launched two new seller programmes — 'Selling on Amazon' and 'Fulfillment by Amazon', providing customers a "convenient and trustworthy" online shopping experience and Indian retailers of all sizes a "robust and scalable platform" to sell their products online with no listing fees and a pay-as-you-go fulfillment services, it said in a statement. "Customers can confidently shop from sellers of all sizes on Amazon.In and benefit from a safe and secure online ordering experience, convenient electronic payments, cash on delivery, easy returns, Amazon's customer service with 24x7 support, and a globally recognised and comprehensive purchase protection provided by Amazon's A-to-Z guarantee, the statement said. Amazon.In is also accessible on mobile devices allowing customers to shop anywhere, it added. In February 2012, the US online giant made its foray into the Indian market with the launch of Junglee.com, enabling retailers in India to advertise their products for free to millions of Indian shoppers and drive targeted traffic to their stores. Larsen & Toubro has steadily expanded its global footprint, recently winning a construction project at the Abu Dhabi airport. The firm is further bidding for about $3 billion worth of projects in the region, including more construction work for Aramco and an oil refinery in Oman, its CEO told Reuters. "International competition is tough, but we'll see," said L&T CEO and managing director Krishnamurthi Venkataramanan by phone on Wednesday. India's economy, the third largest in Asia, has struggled to recover from its worst slowdown in a decade, hitting infrastructure projects. Local firms such as L&T and Tata Power Co have been scouting for growth opportunities abroad, particularly in the Middle East, Africa and Southeast Asia. "Right now, with the present situation in India where the economy is a little slower, we're not starting from zero," he said. "We're already well-positioned. And obviously there is a higher motivation to accelerate that effort because the market is bigger there rather than here at this point of time." In the Aramco project, L&T will build a plant with a daily capacity to process 75 million standard cubic feet (scfd) of gas and 4,500 barrels of condensate, the company said on Wednesday. L&T, whose interests span shipbuilding to railways, has forecast growth in net sales of as much as 17 percent in the fiscal year which started in April. It also sees new orders growing by about a fifth. The Mumbai-based company's profit fell about 7 percent in the fourth quarter of the last fiscal year as existing infrastructure projects struggled to get off the ground. Shares in Justdial, which offers search for local businesses through Internet and mobile platforms, ended at Rs 612.35 after gaining 15.54% on the NSE. The stock hit a high of Rs 631.9, compared with their initial public offer price of Rs 530 a share, valuing the company at Rs 37.03 billion. Despite the strong debut, investment bankers and analysts said Justdial's listing was unlikely to open up India's moribund IPO market in the near term, given only a few medium-to-large sized issues are in the pipeline. "Just Dial is a quality IPO and markets separate men from boys," said Deven Choksey, MD of K. R. Choksey Securities in Mumbai. "The secondary market needs to be extremely strong for IPOs to benefit. So unless it is a unique IPO, it wouldn't be successful." Coal ministry officials said a revised note had been submitted by the ministry for consideration of the CCEA when it meets on Friday to take a final call. While having given an in-principle clearance for allowing coal price pooling in February, the committee had rejected the mechanism in April.